helpful and super nice and answered all my questions." places I'm very happy to have found this spot." "They are detailed and instructive with any questions and concerns." "Everyone was very helpful and welcoming." Medical Abortion: Use of medicines for termination of pregnancy up to 10 weeks or 70 days. Surgical Abortion: Use of surgical methods for termination of pregnancy. LANGUAGES: English; Spanish; Interpretation by telephone available for other languages. Q: For what period of a pregnancy is the medical abortion generally effective? A: According to guidelines by Food and Drug Administration, these regimens are highly effective and can be used for termination of pregnancy of less than 70 days. Q: Is medical abortion painful? A: Pain associated with medical abortion varies from mild to moderate abdominal pain depending on a person’s pain threshold and the gestational age of the pregnancy. Q: How much does a medical abortion cost? A: The price of a medical abortion depends on the center where the termination is carried out, the type of abortion that is done and the gestational age of the pregnancy. Q: Will my insurance cover my medical abortion? A: Most insurance companies cover a medical abortion but it is always important to check with your insurance company just to be sure. Q: What are the legal restrictions of a medical abortion? A: Minors generally require parent’s consent, but it’s important to find out abortion laws relevant to your state of residence. California allows minors to have a termination of pregnancy without parental approval. Q: What is the role of anti-D in medical abortion? A: Women who are rhesus negative would need to receive this anti-D immunoglobulin after a medical abortion to prevent miscarriages in subsequent pregnancies. Q: What happens after taking the second tablet? A: After taking the second tablet, you may feel abdominal cramps and the product of pregnancy starts coming out with blood. This is the normal process. Normally you can take a pain killer and let the pill do its work. Q: Should I take a bath after an abortion? A: Consult your doctor. You may be advised to not take the bath immediately. This is to prevent water entering the exposed area and to prevent infection. Q: Should I do a pregnancy test after abortion? A: You can do that. But always remember that it may take 40-60 days before the pregnancy test becomes negative. So if you do it immediately after, you will get positive result. Q: What about the confidentiality of the procedure? A: If you are doing abortion with qualified doctors and nurses, they will always maintain their patients’ confidentiality. There is no need of worry about your information being leaked out. Q: How effective is the medical abortion? A: Medical abortion is general more effective than surgical abortion in early pregnancy. For pregnancy of less then 7 weeks old, this method will be 98% effective. After that the effectiveness decreases, but still remains as high as 95%. Q: Is it necessary to maintain the duration between two pills? A: Yes. Mifepristone and methotrexate need some time for their work. Only after that the misoprostol will be effective in expulsing all the content. So you need to keep some distance between two pills. Q: Are there any other regimens available for medical abortion? A: Alternative regimens are available, but less used. Sometimes single pills are also used. But studies have shown them to be much less effective than the combination. Q: What pain killers I can take after medical abortion? A: For mild to moderate pain, you can take Tylenol (500-1000 mg). If pain is more you may take ibuprofen (200-600 mg). In very severe cases, even codeine is prescribed. Consult with your doctor. Q: How would I know if I have pelvic infection after abortion? A: If you have fever, nausea, vomiting or diarrhea, lower abdominal pain after medical abortion, you can suspect infection. You should immediately contact a doctor as this is couild be a serious condition. 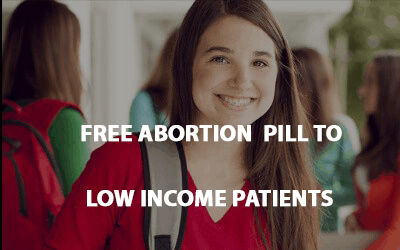 Q: What if medical abortion fails? A: If medical abortion fails, it can be followed by repeat medical or surgical abortion. Her Smart Choice accepts most major insurance plans. Please remember to bring your insurance card(s) with you to your appointment. We also accept cash payment and offer convenient payment plan options.